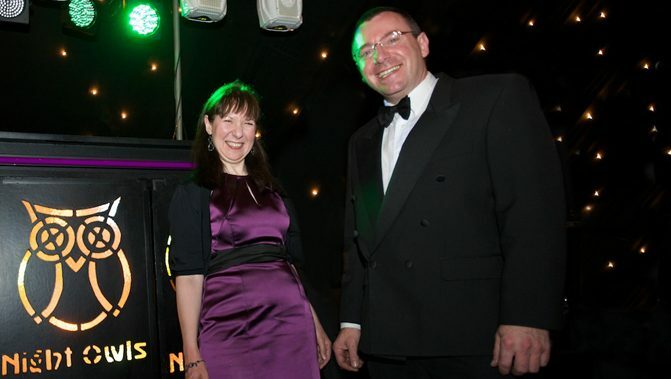 NightOwls Discos, based in York, North Yorkshire is owned and personally run by Bruce and Maria Bendall. Today, just as it has done over the past 35 years, NightOwls Discos prides itself in being a supplier of Discos and Entertainment that are second to none. Whatever your choice of music, one of our specially selected DJ’s can play it, from Golden Oldies to Current Chart, Rock and Roll, Motown, Northern Soul, Soul, Reggae, Rock, Pop, Disco, Indie, Brit Pop, Dance, R and B, etc. If you wish, you can have input into the music selection prior to your event, so that the playlist reflects your choice of music. And, of course, the DJ is always very happy to take song requests during the Disco. Our Discos come complete with a very high quality sound system, and stunning light effects, which are tailored to compliment your venue and size of party perfectly. Therefore…whatever your special celebration…an engagement, wedding, anniversary; an 18th to a 70th birthday party; or a Christening or Children’s Party, and wherever you are holding your celebration…whether it is in an Hotel, Marquee, Historic Hall or Village Hall, Public House or your Home or even a Castle…and whatever the size of your party, from an intimate gathering of 20 people to a large event for 500 plus people…NightOwls Discos will use its vast expertise to ensure that the music and entertainment are perfectly matched to your individual requirements. And, in case of the unlikely event that your DJ cannot make it due to a last minute unforeseen circumstance, eg illness or an accident, we always have DJ’s on standby, ready to take over immediately…giving you the complete peace of mind that your ‘all important’ disco is guaranteed!